Strike-Slip Displacement of the San Gabriel Fault, Southern California. By John C. Crowell, Assistant Professor of Geology, University of California, Los Angeles. Fig. 1. Geologic map of the Ridge basin and adjacent areas. | Click image to enlarge. The San Gabriel fault, which trends northwestward subparallel to the San Andreas fault for a distance of about 90 miles, apparently has a right strike-slip displacement of approximately 20 miles. The evidence in support of this conclusion comes from a consideration of the present distribution of coarse clastic sediments with reference to their source areas, and is described briefly in this paper. Two independent masses of conglomerate and breccia were laid down net to the San Gabriel fault scarp during late Miocene and Pliocene time. These masses have been displaced laterally by almost continuous strike-slip movement on the fault, beginning at some time in the early late Miocene and continuing until about the end of the Pliocene. A more complete description of the argument has been published elsewhere (Crowell, 1952). The San Gabriel fault zone extends through a large part of the Transverse Ranges, and belongs to the system of faults that includes the San Andreas and San Jacinto. On the northwest it presumably meets the San Andreas fault beneath the Frazier Mountain thrust, near the juncture of the San Andreas with the Garlock and Big Pine faults (Crowell, 1950, p. 1641; Hill and Dibblee, 1953, pl. 4). For the next 25 miles of its course from this region toward the southeast, the fault bounds the Ridge basin on the southwest. Between Castaic and the San Gabriel Mountains the fault crosses low hills with little topographic expression, and in this region it limits three oil fields on the northeast: Castaic Hills, Honor Rancho, and Placerita. Through the San Gabriel Mountains the fault is marked by a wide crush-zone, and separates basement rocks of very different types. In the west-central part of the range the fault zone branches; the south branch merges with faults along the south front of the San Gabriel Mountains, and the north branch leads eastward into a structurally complex area, as yet unmapped in detail, north of San Bernardino. The topographic trace of the fault zone is quite straight and is marked by aligned canyons and notches eroded in the sheared and broken rock. The zone generally consists of several faults that separate attenuated slivers, some of which are three-quarters of a mile wide. As a whole it dips very steeply, but major faults within the zone dip at angles as low as 65 degrees, either northeastward or southwestward. In addition to the strike-slip movement on the fault, with which this paper is primarily concerned, there appears to have been a large dip-slip component of as much as 14,000 feet in the area 10 or 12 miles northwest of Castaic (Eaton, 1939, p. 521; Crowell, 1950, p. 1643). Here a great thickness of Ridge basin strata is preserved on the northeast side of the fault, which dips toward these strata and hence is apparently a normal fault. Its principal movement, how- ever, is probably strike-slip. At some other places, as at Castaic, the apparent dip-slip component is the opposite, the southwest side having moved downward. Geology Along the San Gabriel Fault. The 50-mile segment of the San Gabriel fault under consideration here extends from the vicinity of Frazier Mountain on the northwest to the west-central San Gabriel Mountains on the southeast. Although the geology along the fault is simplified on the map (fig. 1), it is shown in greater detail on the map sheets of the Ridge basin, the Eastern Ventura basin, and the Soledad basin, which appear elsewhere in this volume. On the southwest side of the fault and at its northwest end, near Frazier Mountain, the basement rocks consist of gneiss. Quartz diorite predominates farther south in areas that are not yet completely mapped. About 7 miles northwest of Castaic the basement rocks are overlapped by the Tertiary marine sequence of the nearby Ventura basin. South and southeast from this area of overlap, all basement rock southwest of the fault for many miles is covered by marine strata belonging to the Mohnian (upper Miocene) or older stages. Basement rock (gneiss) again reaches the surface in the western San Gabriel Mountains, about 18 miles along the fault from the area of overlap. On the northeast side of the fault, Ridge basin beds (Pliocene) are exposed at the north and extend to within 5 miles of Castaic (fig. 1). These strata lie upon Paleocene and Miocene sedimentary rocks as far north as the Clearwater fault, and on gneiss and granitic rocks farther north. Southeast of Castaic, Miocene and Pliocene sedimentary formations are exposed at the surface, and outcrops of base- ment rock are unknown until the San Gabriel Mountains are reached. Throughout this distance all basement rock is covered by sediments at least as old as late Miocene (Mohnian). The nearest exposures of basement rock northeast of the San Gabriel fault in this region are found about 4 miles northeast of Castaic, and consist of schist and local patches of quartz diorite and gneiss that appear from beneath the Mint Canyon formation (upper Miocene). The geology of the westernmost San Gabriel Mountains has been mapped recently by Donald V. Higgs (see Contribution No. 8, Chapter VII). His map, simplified here, shows a band of gneiss between the San Gabriel fault and a complex of anorthosite and norite. The anorthosite, consisting almost entirely of white plagioclase (An 39-46), and the norite, a dark altered hypersthene gabbro, are distinctive rocks and in southern California are known to crop out only in this area. Evidence for Large Strike-Slip Displacement. The present positions of two different masses of upper Miocene coarse conglomerate and sedimentary breccia, which crop out next to the San Gabriel fault, apparently require a strike-slip displacement on the fault of many miles. Each mass contains coarse clasts of basement rock types that were washed into place from sources across the fault. At present, however, the areas across the fault from each deposit are mantled by sedimentary rocks that are older than the conglomerates, which of course means that the basement rocks of these areas were not available as sources of clasts for the conglomerates. But with a lateral displacement of about 20 miles, e2- posed source areas of appropriate composition are lined up properly with respect to the derived sediments. Anorthosite-Bearing Conglonerates. Southwest of the San Gabriel fault zone, and 4 to 6 miles northwest of Castaic, coarse conglomerates are interbedded in sandstone and siltstone of the Modelo formation, as shown on the large-scale inset map in figure 1. The conglomerates, which represent the Mohnian stage (upper Miocene), are composed predominantly of clasts of anorthosite, norite, and related rocks with some gneiss and granitic types, but lack clasts of schist and older sedimentary rocks. The thickest beds, with large clasts as much as several feet in diameter, lie next to the fault, and thin toward the southwest. In fact, they are not known on the surface beyond the map area. This facies change, supported by a few observations of current bedding and slump structures, indicates that the debris was washed in from areas across the fault to the northeast, and probably came from a source nearby. The composition of the clasts clearly shows that exposures of basement rock must have lain in this general direction during the accumulation of the conglomerates. But this region is now covered by sedimentary rocks older than the conglomerates for distances of several miles northeastward beyond the fault. Surface mapping and well data in this region to date have revealed no basement rock that is not mantled by older sediments. Schist, gneiss, and granitic rocks are exposed 5 miles northeast of Castaic, but clasts of schist and granitic rocks are very rare in the conglomerates. A reconnaissance search for distances of about 20 miles to the northeast has revealed no basement terrane of anorthosite and norite, nor have such rocks been reported from this area by other geologists. About 12 miles to the east, some coarse sedimentary breccias containing anorthositic debris crop out locally in the Vasquez formation (Oligocene or lower Miocene), but these breccias lie beneath the Mint Canyon formation (upper Miocene) and probably were not exposed to erosion during late Miocene time. In addition, the lack of clasts of other rock types in the vicinity of the Vasquez exposures makes it still more unlikely that the erosion of these deposits pro- vided the anorthositic debris in the Modelo conglomerates. But do some of the Pliocene sediments in the area conceal anorthosites and norites that might have contributed debris during Miocene time to the conglomerates? Pliocene rocks are present southeast of Castaic, but well data show that sedimentary rocks older than the conglomerates are present at depth. In the Ridge basin, Miocene and older sedimentary rocks probably underlie the Pliocene section as far north as the Clearwater fault, but the sub-Pliocene geology is unknown in the extreme northwestern part of the basin. Inasmuch as granitic rocks and gneiss are exposed around this small area, however, it seems unlikely that any bodies of anorthosite and norite are concealed. A basement terrane with appropriate composition to serve as a source for the anorthosite-bearing conglomerates is present in the western San Gabriel Mountains, and study to date shows that most of the rock types are lithologically identical with the clasts. It is suggested, therefore, that the western San Gabriel Mountains was the source area for the conglomerates. It seems very unlikely that the boulders and cobbles of anorthosite were washed directly from the present position of the source area. First, the available evidence indicates that the conglomerates came from a nearby source to the northeast, instead of from a relatively distant source to the southeast. Second, sandstones and shales of about the same age as the conglomerates lie in the area between the conglomerates and the San Gabriel Mountains. It would be most unusual for the conglomerates to be separated from their source by contemporaneous finer-grained deposits. The evidence at hand therefore indicates that the anorthosite-bearing conglomerates accumulated just southwest of and across the San Gabriel fault from the San Gabriel Mountains. Their present position, some 15 to 25 miles relatively toward the northwest, apparently requires this amount of displacement on the fault. It is of course impossible to determine just how much displacement has occurred, as it is not possible to work out details of the drainage pattern during late Miocene time and thus locate the conglomerate mass precisely with respect to its source area prior to displacement. It appears reasonable, however, to place the area of conglomerate accumulation somewhere within a 10-mile span that lay 15 to 25 miles relatively southeast of its present position. The Gneiss-Bearing Sedimentary Breccia. Beginning about a mile northwest of Castaic, a narrow band of sedimentary breccia lies along the northeast side of the San Gabriel fault for a distance of 21 miles (fig. 1). Throughout its extent it consists predominantly of blocks of gneiss with minor amounts of granitic rocks, jumbled in an unsorted matrix, and it grades rapidly eastward into fine-grained sediments of the Ridge basin. The breccia, named the Violin breccia (see Crowell, Ridge basin map sheet, this volume), accumulated as a local deposit at the base of a fault scarp, and ranges in age from late Miocene at its base to late Pliocene at its top. The southeastern 6 miles of this strip of Violin breccia, near Castaic, is separated from the sedimentary rocks of the Ventura basin by the San Gabriel fault. Here, too, it is composed predominantly of gneissic blocks that were derived from sources across the fault to the southwest. The area now opposite this breccia, however, is covered by sedimentary rocks that are older than the breccia. Although a narrow fault sliver of gneiss is now exposed in the fault zone, it must not have been available to erosion during latest Miocene time, as it is overlain unconformably by upper Miocene (Mohnian) strata. About 6 miles northwestward from the tip of the breccia belt, and on the opposite (southwest) side of the fault, quartz diorite with only minor amounts of gneiss and schist is exposed; judging from the predominance of gneissic clasts in the breccia, this terrane probably was not the source for the breccia. About 15 miles to the north- west the quartz diorite gives way to gneiss, and it seems more likely that the gneiss-bearing breccia accumulated opposite this part of the basement terrane. If so, the Violin breccia has since been offset about 15 miles by movement on the fault. Coarse sedimentary breccias containing anorthositic debris similar to that described above are present in the Sespe (Vasquez) formation (upper Oligocene to lower Miocene) in Canton Canyon, and they lie unconformably beneath the Modelo formation (see inset map, fig. 1). These rocks, which contain blocks of anorthosite several feet in diameter, show that a rugged source area lay nearby, presumably uplifted along the San Gabriel fault zone. Movement on the fault therefore may have been initiated during late Oligocene or early Miocene time, when the anorthosite-bearing conglomerates of the Modelo formation (upper Miocene) were laid down. The relation of the gneiss-bearing breccia to the San Gabriel fault is even more clear, but the oldest part of the breccia probably was deposited somewhat later than the conglomerate. 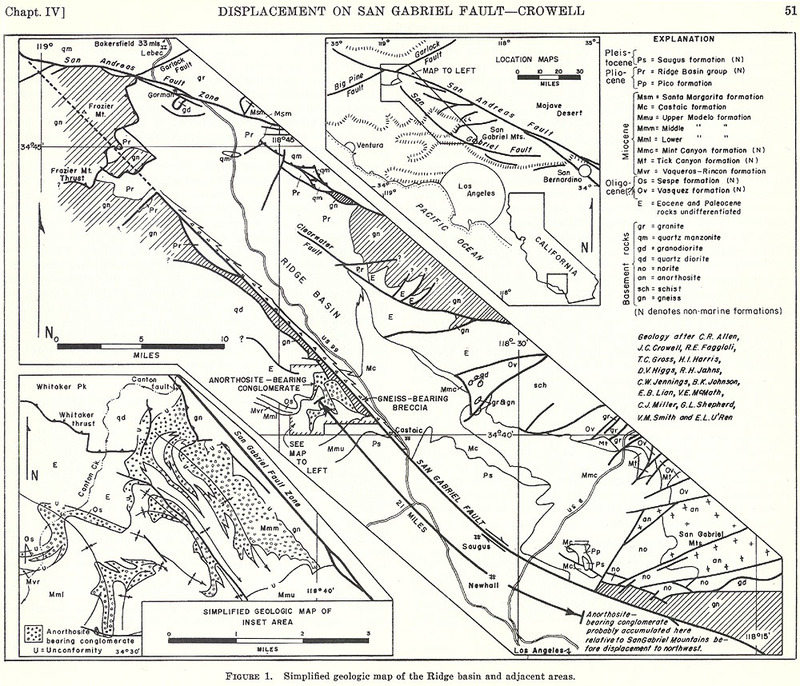 Inasmuch as the Violin breccia ranges in age from late Miocene to late Pliocene, and appears to have required an adjacent steep fault scarp to account for its development, the San Gabriel fault must have been intermittently active during this complete span of time (Eaton, 1939, p. 522; Crowell, Ridge basin map sheet). Movement ceased toward the end of Pliocene time, as shown by the overlap of the fault trace by late Pliocene beds in the Hungry Valley area (Crowell, 1°,50, p. 1643). The fault must have been reactivated during the Pleistocene epoch, however, as it cuts Plio-Pleistocene beds in the region southeast of Castaic. Evidence of renewed movement also is present in the Hungry Valley area (Crowell, 1950, p. 1644). Information at hand, therefore, suggests that during the period of widespread mid-Pleistocene deformation in southern California, the San Gabriel fault was reactivated locally because it provided an already developed zone of weakness. Two independent arguments for right strike-slip displacement of about 20 miles on the San Gabriel fault have been reviewed. Data now available seem to warrant this conclusion, but additional work in the area is required before the hypothesis can be proved. Basement terranes should be mapped in detail, and better sampling and comparison are needed to establish firm correlations between rock types in the conglomerates and breccia and those in the basement terranes. Crowell, J.C., 1950, Geology of Hungry Valley area, southern California: Am. Assoc. Petroleum Geologists Bull., vol. 34, pp. 1623-1646. Crowell, J.C., 1952, Probable large lateral displacement on San Gabriel fault, southern California: Am. Assoc. Petroleum Geologists Bull., vol. 35, pp. 2026-2035. Eaton, J.E., 1939, Ridge basin, California: Am. Assoc. Petroleum Geologists Bull., vol. 23, pp. 517-558. Hill, M.L., and Dibblee, T.W. Jr., 1953, San Andreas, Garlock, and Big Pine faults, California: Geol. Soc. America Bull., vol. 64, pp. 443-458.